While ICD-O-3 appears to give better detail regarding the type of cancer as well as the site of cancer and despite the fact that some jurisdictions use it for cancer registries, the use of ICD10 and the ICD10-M codes results in more expressiveness, particularly when the lymphomas are included. It should be noted that extranodal lymphomas pose a problem - Is a Diffuse large B cell lymphoma of the upper outer quadrant of the breast classified as a C83.3 - M9680/3 - Stage IE(breast), or as a C50.4 - M9680/3 - Stage IE. Cancer Registries are not uniform in their management of this instance. Included in this issue is tha obvious lack of consultations with clinicians who are the ones who decide which code to assign. This has occurred because in the past clinicians have no provided these codes. Now that Cancer Registries can poll the Oncology Information Systems of Cancer Centres (as NSW Health does), they can receive the ICD codes for site and morphology directly from the 'horse's mouth'. The treatment of a nodal recurrence determines the coding of the nodal recurrence. In my thinking, the nodal recurrence is a recurrence of the original disease, not a new diagnosis. We are blessed (cursed?) with this notion of diagnosis and stage, which the makers of ICD seem to have overlooked. To further make my point, I offer another instruction and ask you ponder how you would code such a thing. 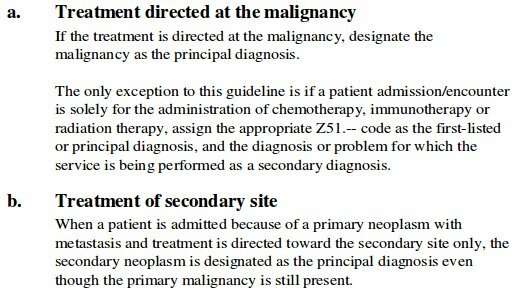 In a patient with a previous cancer, I would add the ICD10 code for the site and morphology and use the date of diagnosis. Unfortunately I can't decipher this. My experience is a hybrid of ICD-10 and ICD-O. The diagnosis is coded as per ICD-10, but a subsequent field allows for selection of histological type (as described above). The advantages of this approach is that the coding is as complete as it can be and no more work than satisfying the dictates of ICD-O-3. I understand that the ICD-10-CM alleviates this somewhat as the coding for lymphomas adds an additional digit to specify site (e.g. C83.38 to denote DLBCL arising in multiple lymph node sites). If you are going to be doing any coding, I would recommend looking at the WHO ICD-10 page which allows for easy searching of all codes. You can find it here. The coding of various anatomical sites is discussed in the following subtopics.